Hung out at CChub…for the first time! Cchub is as I imagined it to be. I am really excited that such a space exists, at least if for nothing else (creating an open innovation ecosystem, Pre-incubation to start-ups gingering the Tech. community etc. ), for providing a shared office space with constant power and internet developers. Like really. The customer friendliness of the bank has taken a rather sad dip. Gtbank used to be the friendly bank: staffs willing to help, smiling and courteous and all; but my experience at the bank was really disheartening. Frowning and saucy staffs was the order of the day. Sad! Then long queues have started creeping into Gtbank. I spent 2 hours at one of the Gtbank branch in Ibadan! Reminds me of the horrors of having to go to Union bank/First bank back then! Well, that isn't surprising..is it? The next weekend after I got back from Nigeria saw me in Germany (Cologne and Bonn). Hung out with a couple of colleagues I worked with last year on AIESEC International. It was nice to see everyone is fine and doing good. Meet some other guys in Cologne that were really into rap music...kindred spirits, we are, I’ll say and we spent some nice time bopping heads to some Biggie, Coolio, ‘Pac, 50, Dre and Kriss Kross. I also completed most of the work on JProwork and its ready to go. JProwork is a Java API wrapper for Prowork. April is the month I eventually managed to rid myself off the attention sucking and time wasting and zombie turning Facebook! It was getting too much. It was like an addiction and it was getting frustrating. It got to the point that I couldn't concentrate on a task at work for 30 minutes straight without having the urge to go check Facebook. At that point it became obvious it was detrimental to my well-being and I needed to kick it out. I toyed with the idea of totally deleting my account but kept on holding back at the final stages; all thanks to Facebook’s various tactics and emotional blackmailing during the deletion process. So instead of deleting, I trained my will power to totally get rid of Facebook. And I did it. I feel a lot better, less drained and focused now. Yes today is April 30! And in Netherlands it’s the Queen’s day! 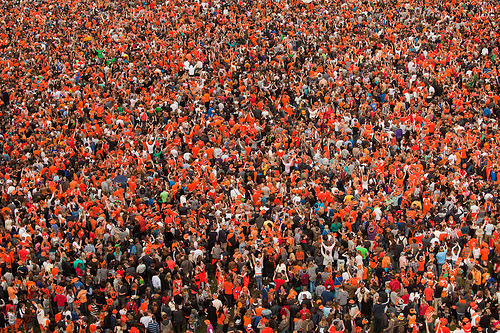 But in Amsterdam, its not just Queen's Day it is one hell of a party! Somewhat a street carnival. Everyone dressed in orange, on the streets, marijuana smoking, party rocking, and Liquor flowing! So you guessed it, once I press the publish link on this post, I am hitting the streets too! JProwork is a Java wrapper for Prowork. Prowork itself is an intuitive project management app that makes team collaboration easy. It was launched 2011 at Start-up Weekend in Nigeria. It recently won the Apps4Africa 2012: Business Challenge. For more information, check: About Prowork and the team behind it and How it works. 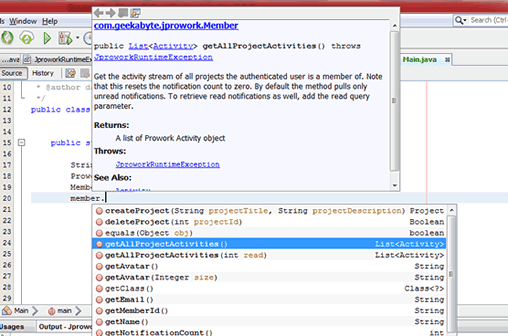 JProwork is then a Java wrapper for Prowork’s API. It encapsulates the API calls to Prowork and exposes Prowork’s entities as Java objects to the developer. It sure would make developing on Prowork faster with Java. Jprowork requires Gson: a Java library that can be used to convert Java Objects into their JSON representation and also to convert a JSON string to an equivalent Java object. Mavenized JProwork and also have it available as Jar files. Documentation is in the code. You can grab a copy of the documentation using Javadoc. A generated Javadoc is also included in the repository. Just because there is no other way to easily keep stuffs on the client side, we sometimes do this; and it is painful! having to unnecessarily pollute the DOM. I was in such a situation a couple of months back where I was on a project in which stuffs, AKA. the states of the application were being pushed to the DOM attributes just to keep them. Dirty!!! simpleJsMap is a simple MAP-like implantation that enables me to keep and retrieve my stuffs easily in the memory via keys and values without having to set things in DOM attributes. Include the simplejsmap.js file into your script. The variable simplejsmap would then be available. So once you have the script included you ready to go. Creates the map like object and assigns it to variable map. You always start using simplejsmap by calling this function. Adds stuff that needs to be kept. The stuff has a value and is associated with a key. Returns true if successfully added and false if not. If the key is already present, nothing happens and false is returned also. To modify the value of a key that is already added, update() function is used. Updates the value already added by a given key. If the given key exists, its value is updated. If the key is not found, no update operationis done. False is returned instead. Removes a value accessible via the given key. If the given key is already in existence, it is removed and true is returned. If not, false is returned. Gets the value stored via given key. Returns the number of stuffs/keys that has been added. Returns all the keys that has been added as an array. simpleJsMap can now be gotten via bower. Just use "bower install simpleMapJs" to add it to your project. In other to implement the Reddit twitter bot for r/Java (@redditJava) and r/programming (@redditprogrammn), I had to get the lists of entries from Reddit, loop through it and call a function to tweet each item. On successfully tweeting, a call back function is called that stores the id of the item that was tweeted. This list of saved Id is checked every time, before tweeting, in other to prevent double tweeting. 3. The tweet function is sending the tweet but it takes a couple of seconds. How then do you deal with this? What would be the correct way to implement a task that needs a callback function inside a loop? The logic to send the tweet is defined as a recursive function. This works because the function to tweet the next item (the recursive function) is also called in the callback function. This would ensure that there is no out of sync situation and the correct tweet would be saved for the one that was sent. The only repercussion in this implementation is that it breaks the asynchronous nature as the tweets would be sent in a procedural manner, i.e. one after the other instead of asynchronous fashion.